This weekend the Russian year in the Principality will be celebrated dancing! It is the first time that soloists from the Bolshoi Ballet will perform an extract of a piece from the repertoire of the Ballets de Monte-Carlo, the Pas de Deux of the balcony scene, from Romeo and Juliet, choreographed by Jean-Christophe Maillot. Within the gilded framework of the Russian Gala that will take place September 12-13 at the Grimaldi Forum, it will be possible to discover Olga Smirnova and Artem Ovcharenko, principal dancers of the Bolshoi Ballet, in Jean-Christophe Maillot’s exemplary ballet. During several days those two wonderful dancers worked with the famous choreographer to grab the gestures and the artistic quality of this piece where the unconditional love of those young adolescents prevails over everything and take us back to the memories of our first love. A strong artistic link that remains with the Bolshoi Theatre and Russia, after the encounter between Jean-Christophe Maillot and Sergei Filin, Director of the Bolshoi Ballet, back in 2009, that enabled a successful teamwork. The latest collaboration was in July 2014 with Jean-Christophe Maillot’s creation of The Taming of the Shrew for the Bolshoi Ballet where Olga Smirnova danced the role of Bianca and Artem Ocharenko performed Luciento in the second partition. This premiere in the repertoire of the Ballets of Monte-Carlo will surely mark the debut of future projects with the choreographic artists of the Bolshoi Ballet. Sergei Diaghilev, a talented entrepreneur who took Europe by surprise for his revolutionary art, installed himself in the Principality at the beginning of the century, creating the Russian Seasons. It was here that Mikhail Fokine created the choreography of Karsavina and Nijinski. The Monegasque public was the first to be amazed by the celebrated ballet Petrouchka by Stravinsky. A plethora of legendary Russian choreographers, dancers, artists and composers marked their strong presence in the French Riviera, with the creation of memorable pieces that form part of the world cultural treasure. Hundred years later, in 2012, the organizer of the Russian Gala decided to rebirth that artistic magic by inviting the present grand stars of the Russian ballet. The stage at the Grimaldi Forum has successively welcomed soloist dancers of the Bolshoi Theatre and those of Mariinsky and Mikhailovsky, perpetuated this weekend by presenting two grand gala performances with several stars of the Russian ballet as guests of honor. 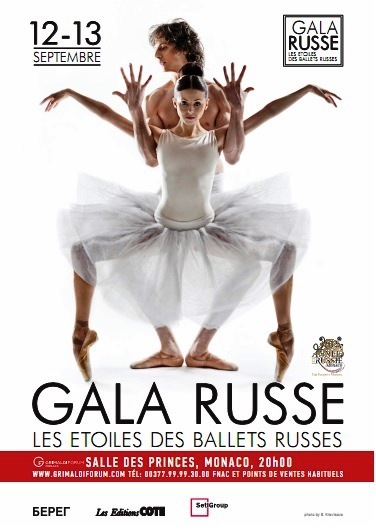 This weekend Olga Smirnova and Artem Ovcharenko will be joined on the stage of the Salle des Princes by other shinning stars of Russian ballet: Irina Perren known as “the pure poetical incarnation of dance”, Sabina Iapparova, the virtuoso Leonid Sarafanov, the king of classical accompaniment Marat Shemiunov of Mihailovski Theatre, Kristina Kretova named the 2013 Revelation by the European critics, the fragile Anastasia Stashkevich, the sparkling Anna Tikhomirova, the manly Mikhail Lobukhin, Olesia Novikova and Filipp Stepin of Mariinksy. The program will be a fusion of timeless classic and contemporary expressive pieces that will make this a memorable event. It was a gorgeous evening! Olga and Artem touched my heart, I am glad that the lines, the manner and the spirit of the Bolshoi were added to this genial ballet. Other artist were also a great success!